High anticipation - and more insults - ahead of the first speech by former chief of staff Benny Gantz, who will declare his candidacy for the premiership, reveal his party platform and is expected to say that Israeli Prime Minister Binyamin Netanyahu is not a king, his family is not royal and that his government “evil and corrupt” (Maariv) and he won’t sit in a government with Netanyahu if he is indicted (Maariv). Netanyahu’s rival, Naftali Bennett, made a comment that some thought was in defense of Netanyahu, when he said that the Attorney General “doesn’t have the power to change the leadership. He has the power to indict or not to indict. In the end, it’s up to the political arena whether to take that and change the government on the recommendation of one man.” Yedioth reported that MK Tzipi Livni, leader of Hatnua party, will launch her party’s campaign today with the slogan, “Saving the democracy” and retired general, MK Amiram Levine, left the Labor Party due to lack of trust in its chairman, MK Avi Gabbay. After the ‘Joint List’ faction alliance split, the Arab parties are considering running as two separate slates. And the left-wing Zionist Meretz party will hold its first ever primary for the Knesset slate. Party officials are concerned about a lack of a spot reserved for an Arab member. Meanwhile, Facebook will block all anonymous paid political ads before Israel's election in an attempt to prevent foreign interference in the elections. Facebook will give users access to detailed information of the identities of those whose ads were approved. Yedioth reported that according to a poll, Jerusalem is a very right-wing city, with 31% voting for Likud, if elections were to take place today. The ultra-Orthodox parties would get 50% of the votes. *Netanyahu also visited the residents of former West Bank outpost, Netiv Ha’avot, and told them that “If it's up to me, there won't be any more uprooting or halting settlements. Just the opposite: The Land of Israel is ours, and will remain ours…There’s this thought that achieving peace with the Arabs depends on us being uprooted from our country, but as long as it’s up to me — there will be no uprooting (of settlers).״ Netanyahu called the June forced eviction of the settlers at the outpost a “blip” and said it won’t happen again. The High Court ordered the settlers be removed because the outpost was built on privately-owned Palestinian land. The settlers now live in trailer homes adjacent to that land. Meanwhile, in February Israel will be hosting a summit for the right-wing nationalist European countries, who are forming a bloc. Netanyahu hopes they will help him change the European Union consensus on issues related to the Palestinians and Iran. These Are the Odds Netanyahu Will Lose in 2019 (Bradley Burston, Haaretz+) Benjamin Netanyahu is vulnerable. His desperation is showing of late, as is his weariness. It's not a good look for him. But what's the chance he'll lose on April 9? All the prime minister's men (Eli Senyor, Yedioth/Ynet) Netanyahu keeps pushing publically to delay any legal moves on his three graft probes until after the April 9 elections, but behind the scenes his camp understands that this is not happening, and they are preparing hard to fight back against possible indictment decision in the coming weeks. Collusion: How Trump’s Peace Plan Helps Netanyahu Win the Election and Avert Prison (Chemi Shalev, Haaretz+) The plan to publish the U.S. blueprint shortly after the April 9 ballot aims to cast the prime minister as a peacenik worthy of leftist absolution. Yair Lapid is paving the way for a government led by Netanyahu - and he will lick his wounds in the opposition (Dr. Revital Amiran, Maariv) In his refusal to join forces with Benny Gantz and his escape from the Labor Party, the chairman of Yesh Atid is paving the way for the establishment of another government that he so opposes. Can the Center Left Ever Win Over Israel’s Middle Class? (Sami Peretz, Haaretz+) Its support is concentrated in the top 20 percent of income earners but that won’t be enough to bring victory in a system dominated by identity politics. A question of contamination (Dr. Haim Shine, Israel Hayom) It seems the Israel Police is leaking information about the Netanyahu investigation to the media in the hope that if they provide the goods now, they will receive sympathetic coverage later. Why Israel’s Election Season Is So Hard and Troubling for Palestinian Citizens Like Me (Anwar Mhajne, Haaretz+) Palestinian citizens of Israel are constantly reminded of the fragility and conditionality of our (second-class) Israeli citizenship, and the illegitimacy of our Palestinian identity - and that's amplified as elections approach. 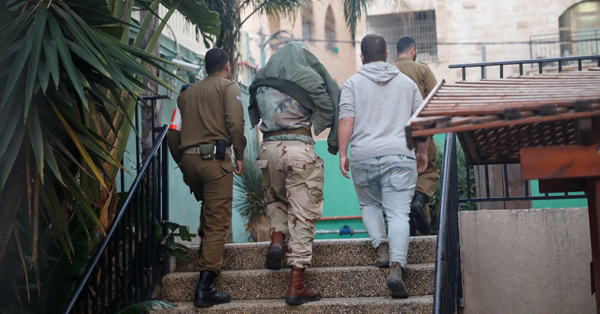 The 11th Commandment (Amira Hass, Haaretz+) The death of Hamdy Na’asan proves one thing: land that is hard to steal by means of Israeli laws is stolen by means of the settlers’ violent, sacred fire and code of silence. When it comes to hatred of Israel, there is no difference between the PLO and Hamas (Yossi Ahimeir, Maariv) The State of Israel is reckoning with the dangers that have emerged from within it. The Palestinians are doing the exact opposite and are encouraging terrorism. The desire to harm us unites Ramallah and Gaza. The Landlord Is Above the Law (Haaretz Editorial) The truth in the land of illegal outposts is that the settlers are above the law, while the Palestinians are trampled by it. The day the conflict died (Akiva Bigman, Israel Hayom) In a fast-changing world with far more pressing problems, and even in Israel, the Israeli-Palestinian conflict no longer carries the same cachet. Maybe this is how we will wake up: It’s good that Nasrallah reminds us that he intends to conquer communities in the Galilee (Meir Uziel, Maariv) Hezbollah secretary-general has succeeded in turning Lebanon into a base of terror and death, and the reminder of his chilling plan against the north is important to Israel, which often sinks into serenity. The false promise of peace (Dr. Edy Cohen, Israel Hayom) Sick and tired of watching Iran plunder their natural treasures, the people of Iraq hope to enlist Israel in their efforts to expel the Iranians by paying lip service to a hypothetical future peace. Who You Calling an auto-anti-Semite? (Carolina Landsmann, Haaretz+) The Jewish right, both in Israel and abroad, has consistently claimed that the Jewish left suffers from auto-anti-Semitism. The real 'auto-anti-Semites' can be found elsewhere. Jews are no longer safe in the streets of Europe (Isaac Herzog, Maariv) A special column by the head of the Jewish Agency: Not long ago, the head of a Jewish Agency delegation in France toured the Champs Elysées in Paris. A young man who saw the skullcap on his head attacked him - and if it were not for the security guard, it would have ended in a tragedy. Peace and Zealots: 30 Days since the death of the author who rarely said, “It seems to me" (Benny Don-Yehia, Maariv) The late Amos Oz was no less steadfast in his views than his opponents, and strangely refused to see Palestinian murderous behavior for what it was. This conduct invites reflection. Emerging U.S.-Taliban Deal Will Give Iran Leverage to Expand Influence (Zvi Bar'el, Haaretz+) Cooperation between Iran and the Taliban, although a limited tactical objective that could achieve a quiet withdrawal of U.S. forces, further confounds the theory of the Shi’ite axis that threatens the Middle East.